During the summer months, Snow Summit transforms one of its two high-speed quads, the East Mountain Express into the Scenic Sky Chair. The chair lift speed is significantly reduced as the lift can be stopped completely for loading and unloading upon request. Guests walk onto the lift and up they go to the top. Once at the top they can unload and hike, run or bike down to the base lodge. Yes, you can bike down. The lift has racks to throw your mountain bike on securely. The lift operators can help you put your bike on and up you and the wheels go. Power to get down is all about you. For the hikers and walkers, the lifts can slow to help you unload safely. No special gear is required when you ride... uh, except your camera. The views of the lake from atop the Snow Summit mountain are incredible. You should also bring water and wear sunscreen. Everyone who rides the Sky Chair needs a ticket. 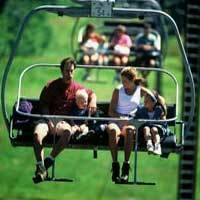 You can Purchase Scenic Sky Chair Tickets at a Discount when avaialable. It is a big savings. This is a must do when visiting Big Bear. All guests of all ages will truly enjoy the natural beauty of Big Bear Lake and the surrounding area. It makes visiting Big Bear on your vacation truly a sight for the eyes!